The PUFP-CT-OW-20A-2USB by Lew Electric is a pop up power box designed to be installed in a countertop surface in dry or wet locations, they are ideal for kitchen islands, bars, restaurants, hotels, or anywhere that you need a kitchen certified power pop up. The top is Off White finish and creates an elegant look in any kitchen. When you need access to your power simply push the button and your power pops up ready for you to plug into the outlets, when you are done press it shut till it closes. 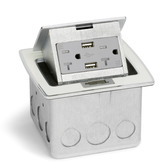 The power receptacle features two 20 amp tamper resistant outlets and two charging USB ports. The 2 USB charging ports share 3.6A and are smart ports, they automatically adjust to your device to charge the perfect amount. To install the outlet it must be hardwired as it does not come with a corded plug. The PUFP-CT-OW-20A-2USB passes electrical code for kitchen use in a variety of ways. 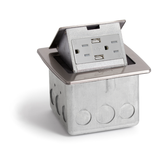 First, the two plugs feature tamper resistant outlets. Second, the outlet is a UL listed receptacle #E60120 and conforms to UL code 514A and 498. Third, the entire unit is ETL and cETL listed to code 3176286 and complies with NEC code 406.5E for countertop use in the USA and Canada.